A fantasy MOBA game (Multiplayer Online Battle Arena) that combines elements of real-time strategy, action RPG, and action adventure game. This title was produced by Valve Software as a follow up to the popular Warcraft III: Reign of Chaos modification, Defense of the Ancients. 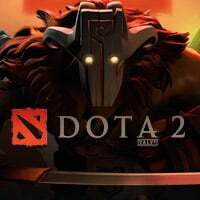 Dota 2 is a sequel of a popular Warcraft III: Reign of Chaos mode named Defense of the Ancients. The game was created by Valve Studios, in close collaboration with co-author of the original modification - IceFrog. Like its predecessor, DotA 2 pits two teams of players (up to five people) against each other. Each participant controls one hero. During every game, the hero gradually earns experience, gains new levels, and collects gold that can be used to buy equipment. The gameplay in DotA 2 is almost identical to that in the original game, i.e. the idea in every battle is to destroy the enemy base located at the opposite end of the map and at the same time to protect your own base. The heroes controlled by players are accompanied with AI-controlled units, commonly called the creeps. The developers decided, however, to introduce a few key changes into Dota 2. There is a so-called mentoring system in the game, which is an attempt to liven the gaming community. Thanks to this, DotA veterans may take on the role of teachers for the novice by suggesting various strategies and items. Such coaches may observe their student’s progress thanks to the option of spectating an ongoing battle. The activity outside the game, which includes creating and editing guides or participating in game forum discussions, is awarded too. For their activity helpful players receive additional outfits for their characters, titles, and various other bonuses. Starting your own adventure with DotA 2 is quite easy, thanks to the introduction of a new matchmaking system that is based on players’ experience. The beginners can also make use of interactive guides and take part in non-ranked training skirmishes against AI. Cooperation between players is enhanced by in-game voice chat, which enables communication without any external applications. The visuals of Dota 2 slightly resemble DotA-Allstars with its distinctive cartoon style. As far as graphics is concerned though, Dota 2 looks much better than its predecessor, as the game uses Source engine. The developers also introduced several important improvements, such as advanced lighting and cloth fabric. Each character has a unique set of animations. There are also some minor changes in audio. The most important of these is a set of completely new characters voices. It is common for heroes to have short dialogues with one another on such occasions as, for example, after a kill or finding an ally. Another noteworthy thing is the replay system implemented in the latest installment of Dota. It allows you not only to view the game, but also gain access to all the key information and statistics concerning it. A spectator has access to such info as the amount of gold earned, experience gained, kills and deaths, the summary value of the equipment purchased, and many others. For larger tournaments, there is also a space for commentator, who recounts live games. Game score 8.615 / 10 calculated out of 1442 players' votes. Expectations before the premiere: 8.8 / 10 calculated out of 1174 players' votes. Guide to Dota Auto Chess contains tips essential to play and win online battles. Our guide to popular mod Dota Auto Chess will help you understand synergies, earn more gold and building your army.